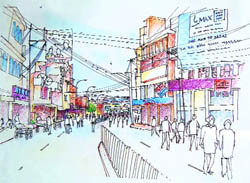 A sketch of the current status of the main road leading to the Golden Temple. With the Punjab government giving its nod to personal rapid transport system (PRTS) for Amritsar, tourists as well as daily commuters on the Bus Station-Golden Temple and Railway Station-Golden Temple route may look forward to a hassle-free journey to their destination as early as by the end of next year. According to the Punjab Infrastructure Development Board (PIDB) managing director, Sukhbir Singh Sandhu, the PRT System in Amritsar will be the first of its kind in India. The ULTra (Urban Light Transport) PRT System is basically a four to six-seater driverless, battery-powered, laser-guided vehicle with a central control system known as pod that uses rubber wheels running on an elevated guide way. It has been developed by a firm named ULTra. The PRT is like a personal taxi which is demand responsive to a commuter, which means it can facilitate on demand non-stop journey within the track network with operational flexibility. Stations are located on side tracks that allows the PRT pods to bypass all stations en route to destination, thereby reducing travel time. The waiting time at stations is also negligible. Headway (the distance in time that separates two pods travelling on the same track) of three seconds enables high-density carriage of 6,000 persons/hour/direction. Another advantage of this system is that PRT stations can be integrated into buildings, facilitating direct entry into malls, hotels and offices. A pod weighs 800 kg, has a cargo capacity of 500 kg and runs at a maximum speed of 40 km/hour. Among its other features are air-conditioning and bi-parting wide opening doors on both the sides. To operate a pod, waiting off-line at a station, a commuter will get access control using a swipe card and can key in destination on platform station, after which pod selects the most economical route for specific destination. Amritsar Municipal Corporation Commissioner DPS Kharbanda said the project would cost Rs 198 crore and it would come up on BOT (build, operate, transfer) basis by the end of 2011. The fare for travelling in a pod would be Rs 15. The consultants in the project, Fairwood, a New Delhi-based firm, will be submitting its final report shortly. The PIDB is the umbrella infrastructure agency in the project. He put the tentative number of pods to be introduced on these tracks at 200. Explaining the concept of negligible waiting time at stations, he said in PRT it is the system which waits for the passengers rather than the other way round. Meanwhile, reacting to the new project, Paramjeet Singh, a daily commuter from Chheharta, said the authorities had taken various steps to ease traffic congestion earlier also but all of them failed. He welcomed the project, but raised doubt on its implementation. Surinder Pal Singh, a tourist from Saharanpur, said every time they come to Amritsar they have to grapple with traffic chaos while reaching the Golden Temple and if any such project comes up, it will benefit tourists as well as local residents. The first commercially operating PRT System was commissioned at Heathrow Airport in 2009.